We are officially settled into a cute condo in Utah! But first, I wanted to share how we got here. May 23 I woke up and heard that Landon had been able to take the day off from work so that we could spend more time with Avery and Trever who were in town for a few days. It was 8am and I wasn’t exactly jumping at the bit to go workout so I spent a little time on Pinterest on my phone still laying on the mattress in our living room from a sleepover I managed to talk Landon into. I came across a pin that started my day on a perfect note, “live less out of habit and more out of intent.” I realized, with that little push from the quote, that my soul wanted time writing + with Heavenly Father more than anything. I got up, playfully smacked Landon on the head who was emailing a friend instead of blogging with the notebook I had just grabbed and walked back to our bedroom. After a few minutes of trying to feel focused, and recognizing thoughts that were from the opposite team “you’ll never get pregnant again.” “think of the life it’d be: uninterrupted CLA taking, preworkout drinking, protein chugging..” I was able to tell those thoughts to scram and a stillness settled in. More than anything else right then, I wanted to experience our family growing to 2 children. And for Landon to be in a job that he’s proud of, enjoys, and feels fulfilled. And we had, we totally had in so many facets of our life: we were praying about future babies, setting goals together, eliminating anything unnecessary or distracting from our lives; but the decision about a career is an interesting thing. No part of that comes overnight. So for a year after we made the decision for Landon to not accept any of his Law School offers he worked on his resume and applied to jobs in the outdoor industry from everywhere from Colorado to Texas to Washington DC. It was after an interview for one last job, this time in Virginia, that Landon got the answer that he needed. His was, “now is the time, get an MBA from UVU” [ready set go]. It was late July, a few months after I had first had my significant answer but this time it was a call to act. Where mine was a suggestion from the most divine sources of suggestions, his meant it was time. We had just enough time to put in a 30 day notice for our apartment (“So we think we’re going to Utah. Like, next month?) As things progressed, Landon was able to apply to UVU even this late in the game, so he put in his two weeks at his job. Two weeks and two days later he was officially unemployed and we were packing up the last few boxes of our house. 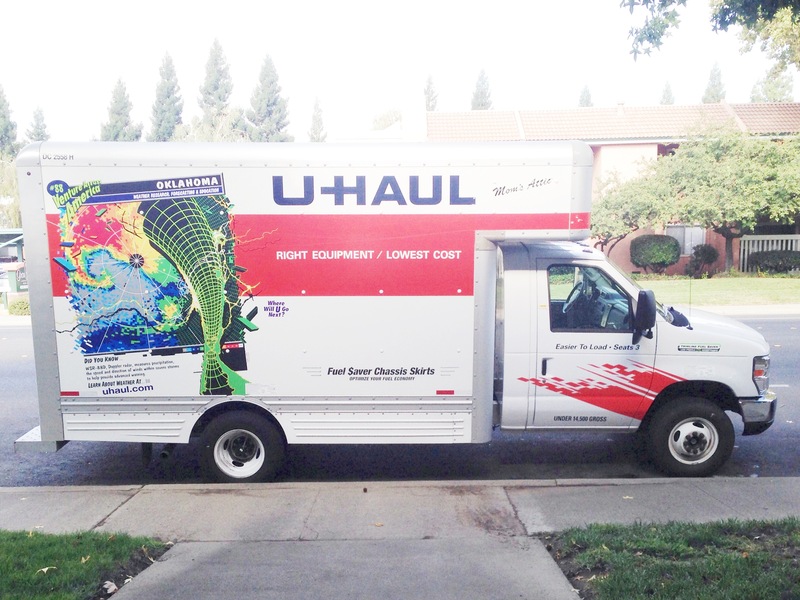 Since our drive out east last Thursday we’ve gone apartment hunting, found a condo to rent, moved in Saturday and had the Uhaul returned early that morning. A day early even! Landon had two job interviews and two job offers by that next Monday, one that he is overjoyed about. He’s started working on prerequisite classes for the MBA program, we’ve unpacked all of our boxes and officially started life in Utah. have greater faith. expect that God can and wants to do big things for you. What’s something you’ve learned or been reminded of after taking a leap of faith? But sometimes they feel like they do. I had the greyest little rain cloud follow me around the other week despite the fact that we were in the middle of a typical California drought summer. Everyone was continuing on with their normal lives outside but I was not ok.
Halfway through the week, with a little encouragement from my little one I headed outside to play the sun. Those first few minutes just being outside made my heart soar. The feeling carried on through early evening. Nothing else had changed. My burden was still the same to carry. But there was a noticeable difference in my ability to continue on with that day. Even when it sounds like the worst thing in the world, and you don’t have a blonde little girl tugging you towards the door, try it. Try spending time surrounded by nature, and see if it doesn’t help just a bit. I hope you have a place that comes to mind. Whether it’s a local book store, coffee shop or large chain department store, the power of kindness is not to be overlooked. They might be being paid to work, but a genuine smile is a genuine smile. And when life is looking bleak I’ll take as many of those as I can get. Is there a support group in your area focused on your personal struggles? Do you have a friend, spouse or family member you can talk to and trust? If so, let someone in. You’ll be amazed at the power of sharing and being vulnerable. I believe that positivity begets positivity. And that negativity begets negative. I can’t imagine a situation when those rules wouldn’t apply. I try to loosely base my life off of this realization by being as positive as I can. There is power in owning and sharing your story. You are accepting where you’re life is, and encouraging those you meet to do the same. Where it takes a negative turn is when it turns into the complaint zone. Those thoughts and conversations encourage us to feel bad for ourselves and hinders our ability to see our neighbor’s struggles. I am a new advocate for writing : during good and hard times alike. Though I peaked with “journaling” in the 5th grade, my sporadic entries still provide the peace and self-awareness that I need. I believe the quote “I don’t know what I think until I read what I say” applies especially well to times of trouble. Though we respond individually to stress– shutting down and out is a common response. Writing is a gently way to combat those responses and to stay checked in. When shii hits the fan, expectations for myself drop the opposite direction. The day-to-day demands, let alone goals such as sticking to a budget or making it to the gym are easily set aside. Prioritize, and be gentle with yourself especially in the beginning stages of survival mode. But what about the moral standards that you held on dearly before? Can I just make a promise that those are the expectations to not let drop a bit. Now is not the time to start doing anything you hadn’t done before. Now is the time to hold tight, be aware, conscious and prayerful. You deserve a lot of things. But should the phrase “I deserve this” ever enter your mind, I hope you’ll think of this. And that you don’t deserve anything that would go contrary to your typical moral standards. You deserve so much more. You deserve healing, you deserve peace, you deserve to love yourself, you deserve a pure heart, you deserve everything good in this world. Get outside when you can. Seek out kind people. Find a support group or confide in someone you trust. Be vulnerable through writing. And most of all, stay true to who you are. This storm won’t last forever. A year ago I was struggling to find the answer to a question that Google would never be able to answer. For days and weeks I included it in my prayers, my thoughts during the day, and the conversations with my husband. It wasn’t something I obsessed over, but it was always there; an unanswered question that was a roadblock to me moving forward with my life. Then one afternoon as I was home with Paityn, I really poured my heart out in prayer. I was tired of trying to sort through my fears, thoughts and what was the spirit was trying to lead me to. I was down the hallway sorting through it all in my mind while absent-mindedly picking up the house when my attention was gently guided to the fresh-cut sunflowers that had been picked up by my husband and set in a water pitcher a few days back. Kind and gentle words followed though the spirit that have since faded in my memory, but the power of that moment will last with me forever, and most of all what it meant. I could have had to go the rest of my life seeking the answer but I was blessed to not have to. And I love that Heavenly Father answered in a way that was personal and special to me. 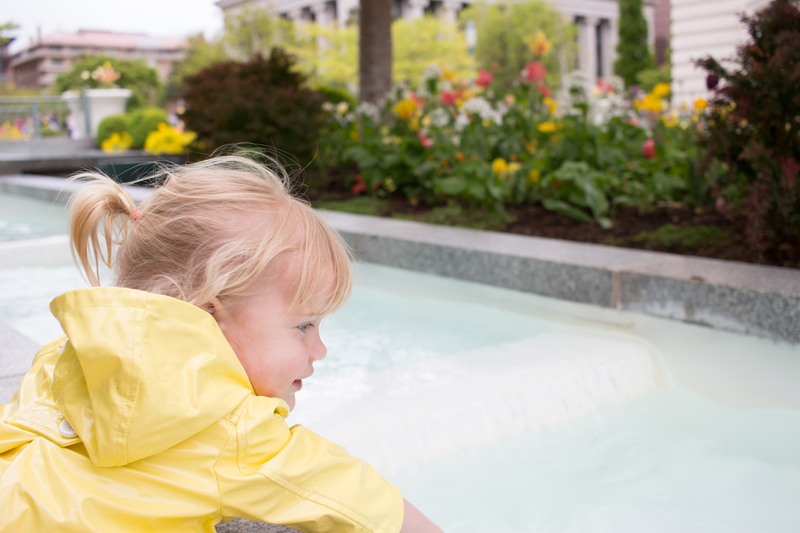 Fast forward to a few weeks ago to where Landon and I were sitting in stake conference, a biannual meeting for members of our faith that reside in the same region. The meetings typically last an hour and a half, and members are chosen ahead of time to prepare a message to share. Occasionally, when there is extra time at the end of the meeting, other members will be called from the congregation and are asked to share their testimony. Being new to the area I had to reason no think that I would be called to add my testimony at the meeting’s end, but my heart was telling me otherwise. We have the opportunity to share our testimonies the first Sunday of every month as part of a dedicated meeting, but when the time came the past week it hasn’t felt right to stand and share. But there in that larger meeting the spirit led me to organize thoughts in my head of the passion and testimony that I have of having spiritual experiences at least every week. To not hold onto the large stories tightly and think that we’re fine; that we need to seek out moments that strengthen our relationship with Heavenly Father as often as we can. Then, as fast as the thoughts were coming, they stopped. It was almost halfway through the evening conference and a woman was still sharing her assigned talk. I was able to relax and sit back in my seat a bit more, and soak up the rest of the meeting. I’m not sure that my name was ever even considered to help contribute to that meeting that night, but I don’t think that was the point of that experience. I walked away that evening so grateful for that experience, and I’ve thought about it long since my frozen yogurt melted later that evening. Am I having spiritual experiences weekly? Am I encouraging others to do the same? I don’t think by any means that they need to be large. But I need to be feeling God’s personal love for me, opening the scriptures and soaking the messages up, and helping give back so much more than I do. Because as we have those daily moments, they add up. Oh how they add up. 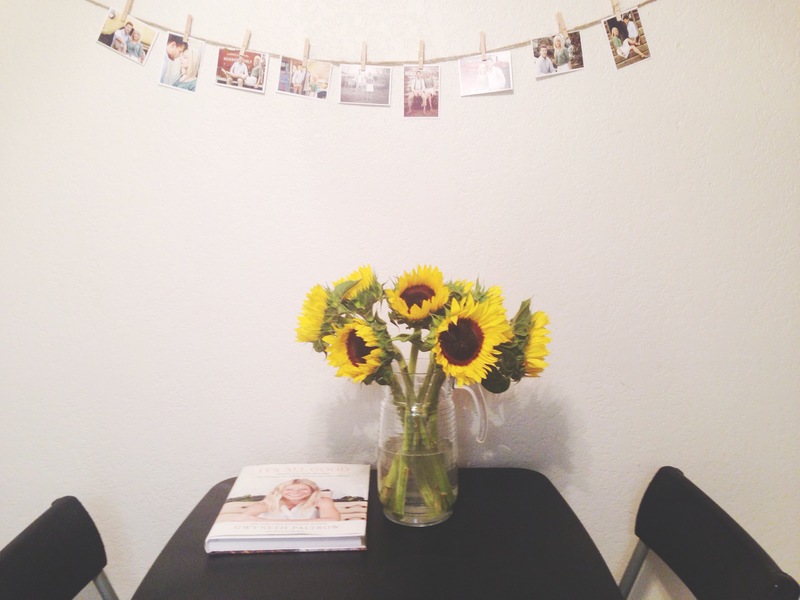 So now, a year later I’m excited to have a new bundle of fresh-cut sunflowers brightening up our home once again. I’m reminded of that powerful experience last year and look forward to the future with an extra pep of faith in my step, that no matter what happens He’ll be there. He always has, always will. And I know that as I try a little harder to live a life full of faith that I can have moments like this more often than I do. 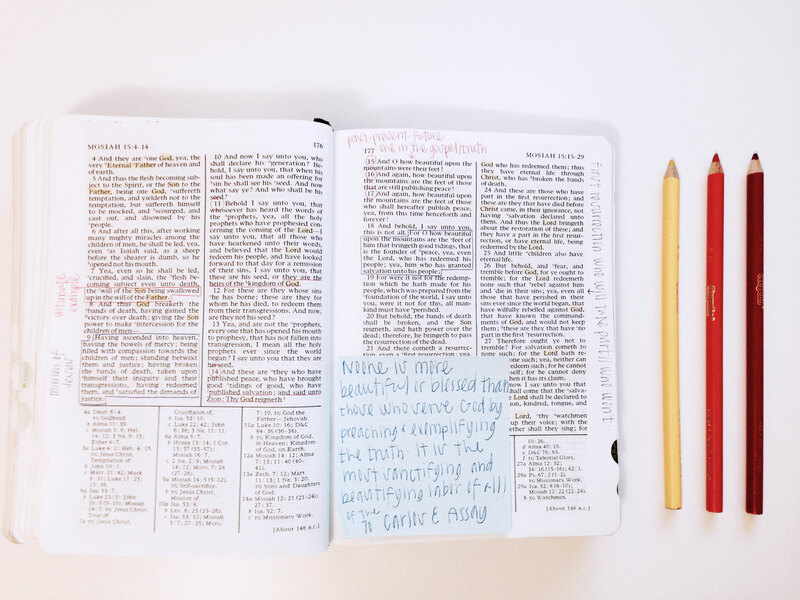 As a girl who loves books, bookstores, and rainy little cafes for that matter, the love that can be felt for the scriptures is like none other. I’m irregular and sporadic with scripture reading, but anytime that I force myself to set aside all electronics and read a chapter, by the time I’m done I want to smack myself on the forehead for all times I didn’t read. I haven’t always felt I had a great love for the scriptures, so making my personal set work for me has made all the difference. If you’re feeling burnt out, frustrated, or underwhelmed with your scripture study I hope that one of these suggestions can help you out. Try using color in a way that helps you stay focused, looks attractive, and will help when you return to that chapter or verse at a later date. Here’s what works for me: I use yellow anytime the Godhead is referred to, I highlight the word or phrase with a yellow pencil; Lord, God, Redeemer, Christ, etc – all marked in yellow. Any time joy, happiness or peace is mentioned I underline the section in orange. Because, I love happy things. Verses that could apply to me in today’s time or that are inspirational I draw a light red box around; that way it’ll stand out the next time I’m flipping through looking for a little extra something. New names or places are underlined in green, which helps keep track of who’s speaking, where the person is, and the significance of the chapter. 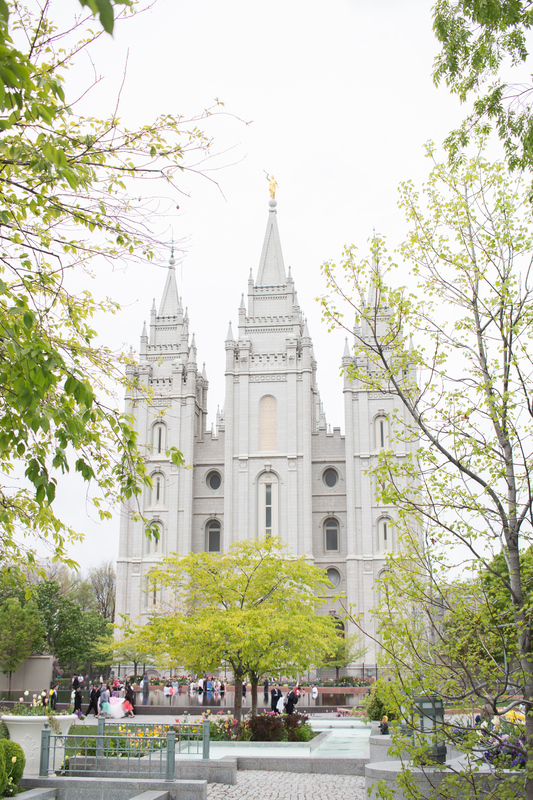 Institute manuals are study guides that are used during semester long classes focused on a certain section of the scriptures: the New Testament, Old Testament, Book of Mormon, Doctrine + Covenants, or on a specific study topic, such as marriage. For $2 you can order them online [free shipping, I mean, c’mon] or pull it up on your phone through the LDS Library phone app. I open the manual after I finish a chapter or two for the day to see what insight or thought I missed. If there’s a quote, thought or explanation that I love, I write it on a post-it note and set it on the scriptures page that it correlates to. This guarantees I’ll always have enough room for whatever length of quote, and save room in the margins for other notes. Seriously, go for it! When you select a chapter on the LDS app you can hit play and be read to. It works best for me if I open my scriptures and follow along as normal as if I were reading it myself. Though there are speed settings I’ve found the normal speed is the most usable: too much slower or faster and the guy turns into a robot. While studying for a youth lesson I found this PDF from a blog, the Red Headed Hostess, and fell in love. She created title pages for every page in the Book of Mormon — from “Lehi sees the future destruction of Jerusalem” to “Come Unto Christ.” It’s amazing. I used her PDF and wrote every title page on the pages of my scriptures, alternating placement for every other page. She also provides title pages for certain books in the Bible: Genesis, Exodus, Leviticus, Numbers, Deuteronomy and Joshua, Judges and Ruth, 1 and 2 Samuel, 1 and 2 Chronicles, Ezra through Ester, and that’s where things ended when I did a quick search through her site. My last tip for studying the scriptures is to set personal goals. Doing so sets it as a priority in your heart, and will hopefully make it more meaningful when you sit down to read. Ideas of goals you can set would be reading consistently for a certain amount of days, reading for a specific amount of minutes daily, reading read the new or old testament from cover to cover, or searching the scriptures for help with understanding an idea such as peace, love or forgiveness. Shortly after giving birth to Paityn I was ready to be pregnant again and to have a million more babies. Despite all the morning sickness + thrown up cherries on the drive to Sunday dinners, there was an excitement about pregnancy that I missed. Knowing that excitement wasn’t enough of a reason to get pregnant again so soon, I set the thoughts aside and allowed myself to fall in love with our sweet daughter. In the months that followed I thought about pregnancy less and less as we settled into life as a family of three. Boredom was replaced with more and more sweet moments together during the day. As I neared 10 months of breastfeeding, I began to start contemplating baby number two, anticipating the emotion of wanting my body to myself for at least 6 months before starting all over again. Having had that time to myself to focus on fitness, motherhood and the balance of it all I am so glad I took that time to myself. I’ve also started hoping that I’ll just magically find myself pregnant any month now. Tiny percentage chances are romantic in my mind, as well as spiritual decisions being made for me. As I was daydreaming about the idea of it all recently, I was interrupted with the direct impression that Heavenly Father needed me to want this next baby. That it needed to be a conscious decision that Landon and I make together. As time has passed I love what that simple answer has taught me. There’s a sweet difference between faithfully aligning our will with His and with presenting our will faithfully to Him. I think both are right, but both are completely different experiences. 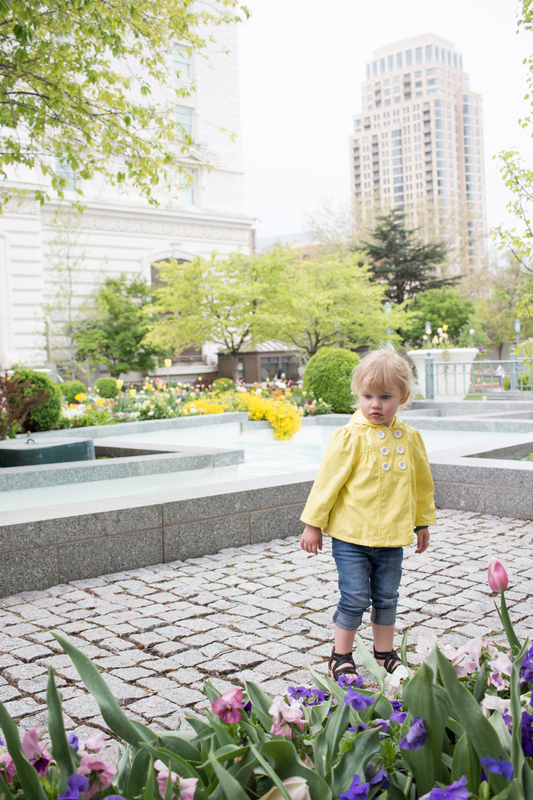 I won’t be blogging about “trying” for baby number two. That falls under the category of things I don’t blog about. But I wanted to share my story before bump pictures happen down the road. These decisions are just as important to me as any other pregnancy post is. This is where it all begins: the desire to know + the faith to act. I hope wherever you’re at in life that you’re having a positive experience of being spiritually led in your life; it’s the best feeling ever. △ sooner or later i believe that all of us experience times when the very fabric of our world tears at the seams, leaving us feeling alone frustrated and adrift. it can happen to anyone, no one is immune. △ i have learned there is something that will take away the bitterness that may come into our lives. there is one thing we can do to make life sweeter, even joyful, and even glorious. we can be grateful. △ being grateful in times of distress does not mean that we’re please with our circumstances. it does mean that through the eyes of faith we look beyond our present day challenges. △ obtain a copy of preach my gospel. it is a guidebook for all of us – read it, study it and apply what you learn. △ our father in heaven reaches out for each of us with His infinite love. he has power over all things and desires to help us learn, grow, and return to him. △ we can trust that he will help us, not necessarily in the way we want but in the way that will best help us to grow. submitting our will to his may be difficult, but it is essential to becoming like him and finding the peace he offers us.